On The Real Housewives Of Atlanta this week there’s not a lot to talk about, we didn’t see Nene at all and I think she brings a lot of the drama to the show. Although, I think Claudia is trying to find a story line. She hasn’t really found one other than to argue with Porsha, who could use her own storyline right now. Outside of their fighting with each other I am not seeing much else happening. Now, if Porsha’s ex husband starts dating Claudia… we might see a storyline. But, I don’t think Porsha cares what he does, however, if Cordell did start dating Claudia that might make her change her mind about that. I am not sure Apollo didn’t stage this texting thing between Phaedra and “Chocolate”. What is with all these girls going off to Africa after their love interests? Maybe when they went on their trip these men saw them and thought they found some “sugar mamas”? Boy is Peter a gossip! He is listening to Apollo and he grins and enjoys it – BUT, I like Peter’s advice to the other guys. He has more common sense it seems than they often show in their marriages. But for Peter to run home and grin and share all that mess with Cynthia? He KNOWS she’s gonna spread it around… he looked like a schoolgirl telling tales. OH… MY… Kenya is writing her own “project”…? That sounds super scary to me, I guess we’ll see, maybe. She cannot get the truth straight about anything – she is telling everyone that Roger Bob told her he’d be there and help her. Roger Bob told her he wouldn’t be there, he didn’t even stutter or skip a beat – he said straight up no, he wouldn’t be there. 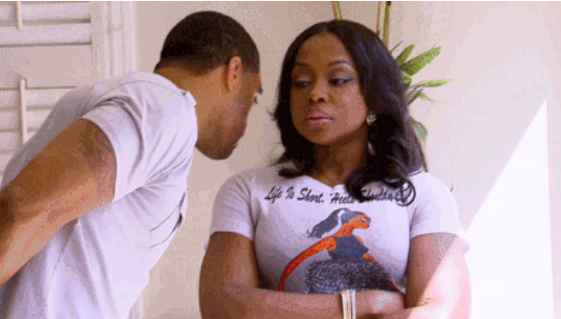 We may never find out the real truth about Phaedra and Apollo, but I just feel like every time I see Phaedra she is setting up her future court case against him. Now, granted he’s giving her a ton to work with, but, she is choosing her words carefully and being extremely cautious how she reacts in front of people. I have a feeling it’s different when the cameras aren’t rolling. She is really guarded. I think we saw a piece of who she might be off camera when Apollo’s friend said he just wanted to see his kids and she yelled at him “He saw his kid’s last might for several hours!”, she then recomposed herself. But, I will say if you made my babies cry and scared over what’s gonna happen to their father, you would need a court order and probably the police in tow to let you ever see them again. That would be IF you could find me. I don’t care who you are.